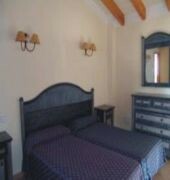 The Villas Maribel are in the quiet resort of Cala Blanca just above the fine, sandy beach. Cala Blanca is a modern purpose built resort with a good pedestrian area in the centre of town as well as two beaches, both of which are clean with fine gently shelving sands that are protected by rocky sides and also offer a variety of water sports facilities and equipment for hire. Nightlife is mainly hotel based; however, the resort does have a few music bars and a disco at nearby Cala Santandria. Ciudadela, Menorca`s ancient capital is two miles away. 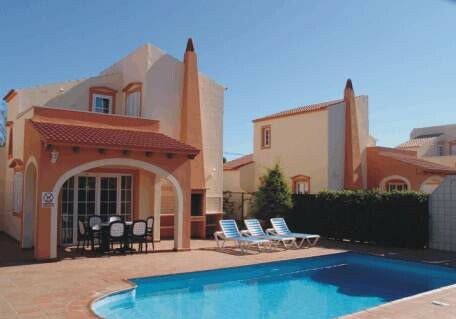 The complex is made up of 20 spacious air conditioned villas, each with their own pool and garden area. Each villas terrace has a BBQ for cooking and loungers for relaxing. Inside the villas guests will find a lounge with a dining area and a TV, a kitchen with a hob, mini oven and washing machine, two twin bedrooms and a bathroom on the ground floor and a master bedroom.